Last week I spoke at the Global Education and Skills Forum in Dubai. 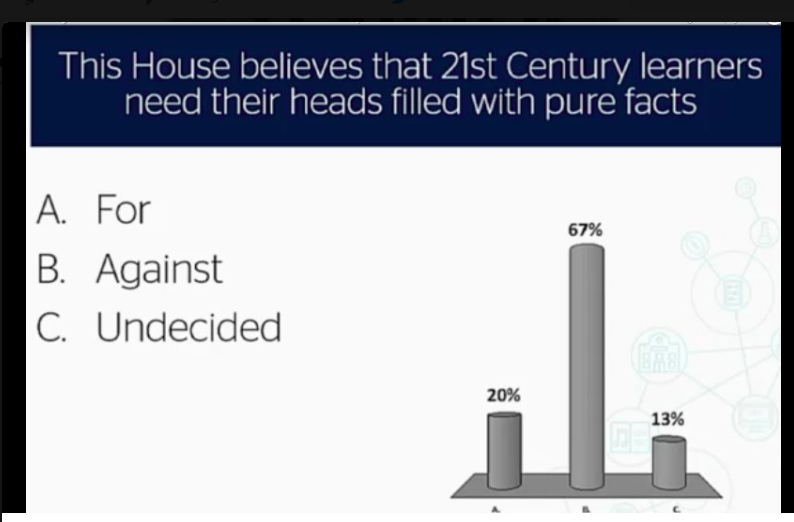 I took part in a debate on the following topic: This house believes 21st century learners need their heads filled with pure facts. I spoke for the motion, together with Nick Gibb, the Minister of State for School Standards in the UK. Speaking against the motion was Andreas Schleicher, the Director of Education and Skills at PISA, who has been so influential in promoting the use of PISA’s rigorous and robust data sets when comparing education systems. Also speaking against the motion was Gabriel Zinny, from the Argentinian National Ministry of Education and Sports. You can see a video of the debate here. For a summary of the my arguments, you can look at some of the previous things I’ve written, e.g. chapters 3 and 4 in Seven Myths about Education, or this blog post here on why the 21st century doesn’t fundamentally change everything. The motion was not an easy one to defend given how absolute and extreme it was – in fact, in a discussion beforehand with Gabriel Zinny, we realised we actually agreed on many things! 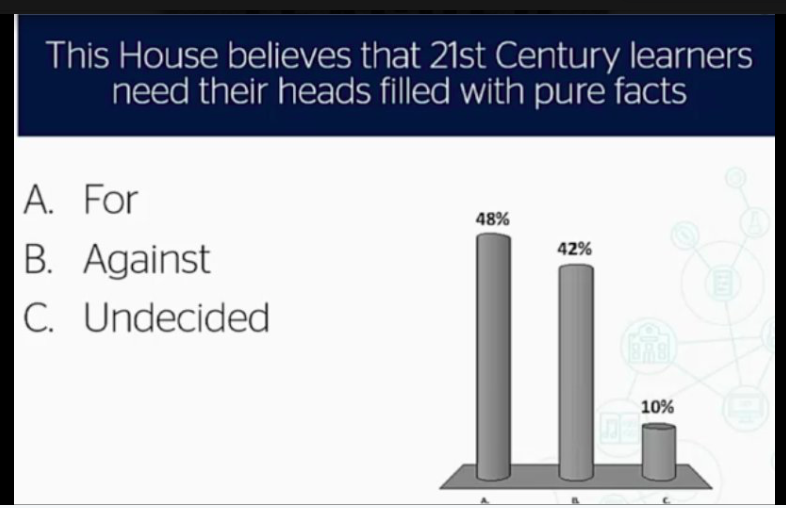 And at the start of the debate, the audience did not agree with the motion, as you can see from a vote taken at the beginning. But when the vote was retaken after the debate, we had managed to win a lot of people round. The rest of the conference was absolutely fascinating. There were a series of other debates, of which my favourite was on one whether we should teach global or national values. Julia Gillard spoke in favour of global values, and Michael Gove in favour of national. They both gave very smart, witty and thought-provoking speeches – I would recommend listening to them. I hadn’t heard of their debate partners, but they were also excellent. Lutfey Siddiqi, speaking in favour of national values, advanced an argument similar to ones I’ve read recently by David Goodhart, about how it is dangerous for global elites to become disconnected from their national communities. Emiliana Vegas spoke of the damage that teaching national values had done in her home country of Venezuela. If I can make some kind of tenuous link between the two debates, I would say that the global concepts I think education should be most interested in are historic global inventions: in particular, the writing and number systems. We take these for granted and sometimes even forget that they are inventions. But writing and number systems are enormously profound and powerful concepts. They are the product of numerous minds from various cultures, and were developed through cross-cultural collaboration in an era long before global conferences. They are also completely abstract and counter-intuitive: it took hundreds of years of trial and error to develop them in their current format, and it is not possible for any one individual to discover or create them in their own lifetime. That, in turn, is one of the main reasons schools and universities were invented: writing and number systems will not be acquired spontaneously, and institutions are needed to safeguard and pass on this knowledge. Perhaps the conservative and ‘national’ aspect of education is that such institutions should be designed to conserve the hard-won knowledge of the past, and such institutions will almost always be organised along national lines, with respect to national cultures. The liberal and ‘global’ aspect of education is that the fundamental concepts we teach, the ones that enable everything else, belong to no nation. When we teach children to read or to count, we aren’t just giving them the tools they need to be able to participate in a conversation with mankind. We’re teaching them systems that evolved globally in an era before long-distance travel. The very existence of numbers and writing show that ideas recognise no borders, and are capable of persisting long after the civilisations and empires that gave birth to them. The highlight of the conference was the presentation of the Global Teacher Prize on Sunday evening. I think the concept of the Global Teacher Prize is brilliant – the work that teachers do should be recognised and celebrated more often. The presentation of the award to the winner, Maggie MacDonnell, was extremely moving. You can see the ceremony here. I also vote for digital globe values, I wonder how far this debate would have gone. Missed it. Very good information for the students and education related persons. Thank you for share.